Losing an employee is not usually a good experience. If they leave voluntarily, you lose a valuable asset. If they have to be fired, you have the arduous task of the progressive discipline process and the final termination meeting. But there are other concerns that arise when an employee leaves. Those concerns are security and their access to company data. Here are some considerations regarding passwords and voluntary termination (A.K.A. resigned) or involuntary termination (A.K.A. fired.) It is important you have a process in place so that whenever a termination occurs, nothing slips through the cracks regarding corporate data security. When you dismiss an employee, you should immediately change out all passwords for anything the employee had access to. Because almost all terminations should be planned, you should also define the process for canceling access. It is unwise to cancel prior to the termination meeting. If you do that, you create the potential for a confrontation when they arrive at work and find their passwords have been disabled. Instead, plan ahead and assign someone to disable their passwords during the time you are having the termination meeting. Before the meeting, be sure you have a list of all access cards, keys, etc. prepared so they can be cancelled before the employee leaves the building. 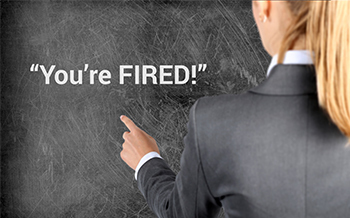 Voluntary terminations ­- Different firms have different policies handling resignations. Depending on the specific position, an employee will be permitted to continue working during their 2 week notice period. In that case, you need to consider if there is any possibility the employee might get up to no good during the final days. That is something only you can judge. In some cases, firms will ask an employee to leave the facility immediately. In that case, you need to have a plan in place. You need to have a list available of all of the restricted systems to which they have access for when this situation arises. The employee should not leave the building until all of their access has been canceled. This all may seem a bit harsh, but things have changed. 30 years ago, for a disgruntled employee to steal files, they’d be carrying out large boxes of file folders. Now, not only can they empty the building onto a thumb drive, they can take nefarious action that wasn’t possible when data was stored on paper.